When a tooth is extensively damaged from a fracture or decay, or the shape and/or function of a tooth needs improvement, a beautiful, porcelain crown may be recommended. A crown is a 'shell' of porcelain that is placed over a tooth to restore its function and appearance after the damaged structure is removed. In most cases, Dr. Gore is able to fabricate a 'same day' crown with the latest, advanced technology. Our impressive computer software uses a CAD milling unit to fabricate your crown right in our office. There are no gooey impressions taken and you don't have to baby a 'temporary' crown for 1-3 weeks while your permanent crown is being made by an outside lab, often increasing the fee that you will pay. 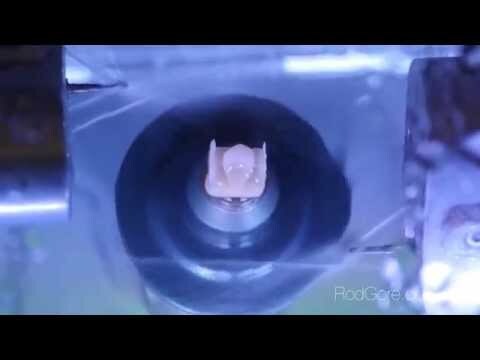 Dr. Gore's team uses CAD (computer-aided design) assistance and in-house milling to create your crown, which looks and feels like natural teeth. "Fantastic service! Professional, high-tech, efficient service!" "Best Scottsdale dentist is Dr. Rod Gore. I've experienced this many years and it's true each time I visit." The total cost of a dental crown will depend on the materials used and if the crown will be fabricated in the mouth. Our financial specialist can review payment options and review insurance coverage for those patients with dental benefits.